This badge was issued to Natalie Lane on 17 Oct 2017. 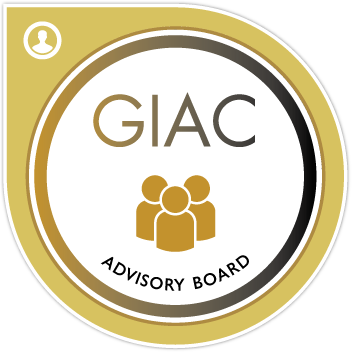 The GIAC Advisory Board is an invitation only, email-based forum where IT Security professionals can exchange ideas and advice. Invitations are extended to GIAC certified professionals who demonstrate exemplary performance on GIAC exams. Members are often consulted as subject-matter experts for content-related issues in various GIAC program needs.